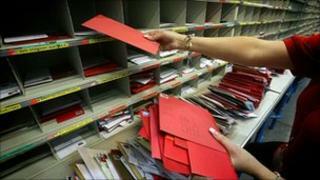 The Royal Mail has announced that it will cut more than 1,700 jobs and close two mail centres in London. The job losses include 1,000 managers across the UK and 751 employees in London after the "phased closures" of the centres in south and east London. The company said the cuts were necessary as it expected the volume of mail posted in London to have halved from 2006 levels by 2014. Royal Mail said it had cut 65,000 positions since 2002. The Royal Mail's south London centre in Nine Elms Lane and its east London centre in Bromley-by-Bow will close, saving an expected £30m, the company said. The company said it believed it would not be forced into making compulsory redundancies. "With people demonstrating reasonable flexibility, Royal Mail expects that everyone who wants to remain in the business will be able to do so," it said. Mark Higson, the company's managing director of operations and modernisation, said: "Royal Mail's modernisation programme, which is vital to ensuring a successful future for the letters and parcels business, depends on having the right number of people in our business, as well as deploying the right technology and equipment." The firm also said that about half of its 64 UK mail centres that were open in 2010 could close by 2016. Royal Mail has suffered as more people use the internet to communicate, with e-mail replacing the need for letters in many cases. It has also been hit by increasing competition from a growing number of private operators. Next month, the price of stamps will increase sharply as it looks to increase revenues. The cost of a first-class stamp will go up by a record 5p to 46p, while that of a second-class stamp will rise by 4p to 36p. Last month, the service was also given permission by the regulator to charge more to business customers.